This week, the internet was riveted by the story of the deportation of Jorge Garcia of Detroit, Michigan to Mexico. Garcia had entered the U.S. illegally as a child, lived in the U.S. for thirty years, is married to a U.S. citizen and has two United States citizen children. He has no criminal record. 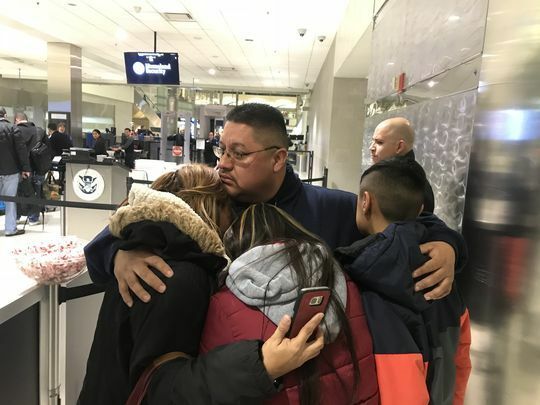 On Monday, January 15, 2018, Martin Luther King Jr. day, Immigration & Customs Enforcement (ICE) agents escorted Mr. Garcia out of the U.S. His tearful goodbye to his family horrified millions. Yet, many wondered why Garcia “didn’t just become a citizen.” I am going to try to explain what I think occurred here based upon the reports in the media. I am not involved in this case and have never discussed his case with any of his lawyers. I am also going to explain the obstacles he likely faced in seeking to regularize his status. If anyone with personal knowledge of the case reaches out to let me know that I am wrong, I am happy to amend this article. However, if you write me to tell me that this family deserved this, I reserve the right to think you are a terrible person. The media has reported that Garcia entered the U.S. illegally as a child thirty years ago. That would have made him 10 years old at the time, around 1988. There is little reporting as to what Garcia did between 1988 and 2009 when Garcia received a final removal order. Obviously, he attended school, perhaps worked, and got married and had his children along the way. His children are 15 and 12, so the first one was born in 2003 and the second in 2006. Back to the removal order: I am presuming that this removal order was entered by the immigration court in Detroit. This court is notorious for being one of the most immigrant-unfriendly jurisdictions in the country. It is unclear how Garcia wound up in removal proceedings or what happened in those proceedings. However, the removal order was final in 2009 at which point ICE was free to remove him. ICE did not seek to remove him between 2009 and 2018. ICE removed Mr. Garcia on January 15, 2018 to Mexico. Why didn’t he become a citizen? Put briefly, there was no legal way for him to do it. First, as a preliminary matter, one does not “become a citizen.” In order to seek citizenship– voting, U.S. passport, jury duty– a person must be a permanent resident or have a “green card.” Any analysis of his ability to “get legal” must start with an inquiry into whether Mr. Garcia has an opportunity to seek permanent residence. Since Mr. Garcia entered without inspection by crossing the border, he was barred from seeking residence in the U.S., except under certain exceptional circumstances. The bar to seeking residence in the U.S., a process known as adjustment of status, meant that he could only seek residence at the U.S. Consulate in Ciudad Juarez, Mexico. However, there is a catch-22 to that option. Having been unlawfully present in the U.S. for more than one year since turning 18, had Mr. Garcia left the country, he would have been subject to a ten year bar to his return to the U.S. He married a citizen, doesn’t that automatically give him a green card? No. Marriage to a U.S. citizen allows you to apply for a green card. You must meet the eligibility requirements. The bar to seeking residence in the U.S. if you entered unlawfully applies even if you are married to a U.S. citizen. It applies even if you were a child when you entered. There is a limited exception which might have allowed him to seek residence in the U.S., but that provision expired in 2001 and was never renewed by Congress. While his wife could petition for him, he would have needed to leave the U.S. to seek an immigrant visa at the U.S. Consulate in Juarez, Mexico. Departing the U.S. would have imposed a 10 year bar on his return, which means that the consulate could not issue him a visa, even with his wife’s sponsorship. There has to be some way around that bar, right? Yes, there is a waiver for the ten year bar. An immigrant can seek to waive the ten year bar if he can demonstrate that his U.S. citizen or permanent resident spouse or parent would suffer extreme hardship if he is denied a visa. Note that this waiver does not take U.S. citizen children into account. Until 2013, an immigrant had to seek that waiver abroad after being denied a visa in Juarez. In other words, an applicant must go through the entire petition process, leave the U.S., apply for a visa, and get denied due to the ten year bar before he could seek the waiver. It was not uncommon for processing times for those waivers to exceed one year. So, if Mrs. Garcia petitioned for Mr. Garcia, he would have had to leave his wife and children and his job to apply for a visa in Juarez. He would be denied and he could seek a waiver, which would have certainly meant at least a year outside of the U.S., if it was approved. If it was not approved, he would face nine more years of separation. It is no wonder that very few immigrants were willing to take this risk. In order to persuade more people in Mr. Garcia’s situation to seek status through this process, the Obama administration changed the process for seeking waivers in 2013. The administration allowed immigrants to seek that waiver in the U.S. If that waiver was approved, they could go to the Consulate in their home country and seek a visa without taking the risk that the waiver would be denied. That new process is known as the provisional waiver. Why didn’t Mr. Garcia seek a provisional waiver? The provisional waiver certainly could have been a help to Mr. Garcia. However, the rules in 2013 prohibited people who had removal orders or were in removal proceedings from seeking a provisional waiver. It was not until August 2016 that the rules were relaxed to allow individuals with removal orders to follow a process to get a provisional waiver. While the reports contain no information whether this process was initiated by Mr. Garcia, it is certainly possible that the process is ongoing. How did he wind up in removal proceedings? That is not clear. The most common ways that people wind up in removal proceedings are: (1) some type of contact with law enforcement; and (2) applying for benefit from immigration and being denied. The reports indicate that Mr. Garcia has no criminal record. Despite that, many people wind up in ICE’s custody if they are pulled over for traffic offenses and can not prove their lawful immigration status. It is possible that Mr. Gracia was pulled over for a traffic violation and was turned over to local law enforcement when he could not provide proof of his immigration status. The other way that people wind up in removal proceedings is by applying for benefits that they don’t qualify for. Perhaps believing that being married to a U.S. citizen entitled Mr. Garcia to residence, he and his wife could have filed a petition for him and an application for adjustment of status. But, as discussed above, due to his unlawful entry into the U.S. when he was 10, he was not eligible to apply for adjustment of status. The Citizenship & Immigration Service would have denied his case and placed him into removal proceedings, under such circumstances in 2006, when the removal proceedings were initiated. Could he have done anything in immigration court? Yes, he appears to have been qualified for cancellation of removal, a form of relief from deportation. I have no idea whether he applied for it, but it would be a natural option for someone with a lengthy residence in the U.S., U.S. citizen family ties and no criminal record. Cancellation of removal is available for an individual who; (1) has been here for ten years; (2) has good moral character; (3) and whose deportation would cause exceptional and extremely unusual hardship to a U.S. citizen or permanent resident spouse, parent or child. If Mr. Garcia made an application for cancellation of removal, I would speculate that he met the first two requirements but the judge found that he failed to demonstrate the very high level of hardship required to satisfy the standard. The hardship standard for cancellation of removal is hard to meet in court and especially so in an immigrant-unfriendly court like Detroit. I would guess that he made such an application. Media reports state that the immigration judge entered a removal order in June 2006 and Mr. Garcia appealed to the Board of Immigration Appeals. The order then became final in 2009 after the Board rejected his appeal. The appeal suggests that Mr. Garcia filed an application for relief that was denied. DACA was instituted in 2012 and allowed individuals who were brought to the U.S. as children with the right to seek protection from removal. In order to seek the protection of DACA, an immigrant could be no older than 31 on June 15, 2012. Mr. Garcia was about 34 years old at the time. There was an effort to expand DACA that would have helped Mr. Garcia, but that effort was stalled and abandoned after 26 states, led by Texas, filed suit to stop the Obama administration’s executive actions on immigration. Why didn’t he get removed between 2009 and 2018? As discussed above, once the order of removal was final, ICE was able to remove Mr. Garcia. However, because ICE determined Mr. Garcia not to present any threat to public safety or national security, they likely did not take any immediate steps to secure his removal. Media reports that ICE exercised its discretion in 2011 not to remove him at the time. During this time, ICE was operating under a set of rules that admonished ICE officers to focus their removal efforts on those who were dangers to the community, recent entrants, national security risks, or serial abusers of the system. These rules were based upon a recognition that ICE does not possess the resources to remove every single removable immigrant and should, therefore, focus its efforts on who present a danger or flagrant disregard for our laws. The “priorities memos,” as they were known, directed ICE officers to prioritize dangerous individuals over individuals like Mr. Garcia. Accordingly, repeatedly between 2011 and 2017, ICE exercised its discretion not to expend its removal resources on seeking Mr. Garcia’s removal. Yes. For the previous seven years, ICE exercised its discretion not to remove him. ICE made a judgment that removing a guy who has been here for thirty years, has a tight U.S. citizen family, has no criminal record and had no complicity in the manner of his entry was not a good use of its resources. When the Trump administration took over, ICE Director Thomas Homan stated that ICE would seek the removal of all removable immigrants. The media is full of reports of the deportation of such people. At the time the Obama administration ended, his administration was litigating a plan to provide individuals like Mr. Garcia with a protection similar to DACA. That effort was abandoned upon the change in administration. I am confident that had Hillary Clinton won the election, her political leadership of ICE would have continued the policy to prioritize the removal of the dangerous over people like Mr. Garcia. Thanks for very clear and complete analysis! Very good explanation of Mr. Garcia’s case. His Family will have to move closer to Mexico until his problems can be resolved. He might have to wait another 10 years unless a waiver is granted. Don’t offer what sounds like simple solutions to devastating problems. An article stated his wife was retired. Not that that makes a huge difference. People move and find new jobs all the time. My military family moved 9 times even out of country and nobody cried for me. We moved and still got little to no money for our service. Once you are an adult, you are culpable. What is so wrong with them moving to Mexico. Oh I forgot. THEY HAVES RULES IN MEXICO AND WONT LET HIS WIFE AND KIDS IN. And the military funded those moves when you were a kid, too. Not everyone has someone else to pay for them to move, or has a new job waiting for them on arrival. Way to be a jerk. His wife has disability retirement. She will not move the family, because their children also have their own medical needs, and all their doctors are in the Detroit area. It would be too difficult not only to uproot their lives, but also to get all new medical providers familiar with their needs. Great temporary solution, if they can swing it! Thank you for this concise and well-written explanation of Mr. Garcia’s plight. This kind of information is vital as we seek ways to right the wrongs of our current inhumane and backward-thinking immigration policies that devastate the lives of so many families. Justice? Just Us? Just is. since he was married to a US citizen. I hope that provision is still available for overstays who entered with inspection and get married to a US citizen. An individual who was admitted to the U.S. and is married to a U.S. citizen may seek adjustment of status despite an overstay presuming that she meets the other requirements for adjustment. He was not admitted into the US officially though. Was undocumented as a child. Read the article. It answers your question. No. He would still have to go back to Mexico and apply there. I went through this with my ex husband. Amazing that a place like Detroit, that suffered constant hardship over the years would treat immigrants that added to their community and economy so coldly and harshly. I am sure that the City of Detroit and environs very much wanted the man to stay. This was the feds. Thank you, Amber. A trusted source, you answered most of our questions about this case and for those which will undoubtedly follow. Could have volunteered to join the military and serve the country he lived in and wanted to remain in, and raise a family. The American Way. I served with several solders that received there citizenship in that exact way! One,who I became friends with came from the same city in Mexico, Juarez. If there is a will there is a way!!! Some just defy the rules. Wrong! Undocumented folks can’t join the military. Permanent residents can join the military and can obtain expedited citizenship. Not just wrong on the facts and law, but sanctimonious shaming of those who “just defy the rules.” How small minded and mean hearted. Ava, I have heard that some people who are protected by DACA have served in the military? Is this incorrect information? Yes. DACA holders were permitted to join the military. Curious what will happen- will they discharge and seek to deport service members? Seems like that would be unpopular. They’ve already done this to veterans. https://www.google.com/amp/s/www.washingtonpost.com/amphtml/news/checkpoint/wp/2017/11/16/the-story-behind-this-powerful-photo-of-deported-military-veterans-saluting-the-american-flag/ It didn’t seem to have an impact…. Not true Ava… MANY MANY undocumented individuals have served this nation WITH honors and they have STILL found themselves deported for whatever reason because of an over ambitious ICE director! This is incorrect.There are so many cases where the army has promised green cards only to be deported later. The complexity of your answer just shows how law makers create rules that are so mumble jumbled with options that it takes a lawyer (at great expense to the person) to unravel and understand. All of this is then used for political gain. Why didn’t obama pardon Mr Garcia and other people like him? This is all about politics and money. Not sure you can pardon a “non-resident” or even a resident non-citizen. There are different rights for citizens, resident aliens, and for non-resident aliens. A president can’t pardon an immigration violation. The presidential pardon power is limited to federal crimes, and being deportable or lacking valid immigration status is not a crime. “If you have a final order of removal, exclusion, or deportation (including an in absentia order of removal under INA 240(b)(5)), you can only obtain a provisional unlawful presence waiver if you have applied for, and we have already approved, Form I-212, Application for Permission to Reapply for Admission into the United States After Deportation or Removal, at the time you file Form I-601A. Is this the same guy? If so, would it explain some things? The dates don’t match. The Sixth Circuit court’s decision notes that that Garcia becMe a lawful citizen in 1995, whereas the Garcia in question arrived illegally ca 1988. There are many hoops to jump through. I have friends here on green cards who have no interest in becoming citizens and one who likely will. The last one does find US two-party politics confusing. It is a disgrace that ICE is now going after soft, easy targets rather than working to remove genuine criminals. Shameful. Thank you for filling in the blanks. There is a court conviction floating around with his name and address on it for drug posssion with intent to distribute from 20 years ago. Could this have something to do with the deportation ruling? Wrong Jorge Garcia. The dates don’t match. See the above comments. No, you have the wrong person. Jorge Garcia is a very common name. That Jorge became a lawful resident in 1995, this Jorge came into the country illegally in 1988. If you actually read the article you would see that this Jorge Garcia has no criminal record. The media reports that his first lawyer was ineffective. He should have sought volunteer departure and bit the bullet and appliwd for I 601 like everyone else does instead of procrastinating. Mexico is not Siberia. 1 year is on the longer side of the waiver. With a US citizen wife and two US born kids, he would be a strong candidate. I thought having a child who was born here meant you got to stay. That’s why so many ppl have anchor babies here. If you have a citizen child, that child can indeed petition you. When said child is a minimum of 21 years old, that being still age of majority for immigration purposes. I’m not sure about what they do re. affidavit of support for a young petitioner; normally you have to demonstrate ability to support the intending immigrant above the poverty level during the first several years when they don’t qualify for any government benefits. He got in trouble in 2006 and his appeal was denied in 2009. Why is this Trumps fault? If there is any issue to be taken up it is with the laws that have been put in place. Bad as this may be, this problem reform has been pushed down the road for 30 years now and no one has done anything about it. There’s probably blame to go all around here. I hate it for this man but he has some part in this. If he tried to get assistance illegally and he knew willing that he couldn’t this is his own accord. Its very sad to rip a family apart after they have established a home and living, who and what did he do for a living? This is not mentioned and did he and his family pay taxes. Its hard to say but usually, it is because they have done something wrong, which should be the case. What a mess. Disingenuous to say this is non Trump, especially when not noting that the highest number of deportations under any on POTUS happened under 44. No, this man was given plenty of time to plan for this contingency- that he may have to live 10 yrs in Mexico. Just this morning my brother asked me why in 30 years did he not become a citizen. Thank you for this through, clear analysis of the process that Mr. Garcia faced. I have forwarded the link to my brother. Very good analysis. As someone who has experienced the process, I can say that it is not for the faint of heart. In my opinion, instead of punishing those who came here without a legal path, those who hire ilegal immigrants should the ones punished. That will help solve the problem and avoid problems like this one. Mr. Garcia could have returned to Mexico with his wife and married in Mexico and then applied for a green card so he could reside in USA with his wife. Since there was no record of him having been in the USA before, the U.S. authorities would have no way of knowing that he had been there illegally. I know that this works, because my daughter’s husband did it. She is a U.S. citizen and they married locally in a civil ceremony. He applied for a green card at the U.S embassy and it was issued 2 weeks later. This was 23 years ago. After 5 years marriage and living in the USA, he became a U.S. citizen. Uh, he had a removal order. Also, lying to immigration officals is a crime and a permanent bar to ever getting any permission to enter the US ever again. He married an American woman and has kids born in the US. He could not claim with a straight face he has never been in the US. Your daughter’s husband is damn lucky he didn’t get caught lying . If he had, he would have been deported and never allowed back in. She could have been prosecuted for an attempt fraudulent marriage. Also, he had been here illegally since he was a child so one can assume he went through public school here—meaning there would be many, many records of him being in the U.S. As stated, lying to USCIS about this would only bar him permanently. Again, he had no options as he was brought here illegally through no fault of his own. I have to agree with Frank’s comment: “Mr. Garcia could have returned to Mexico with his wife and married in Mexico and then applied for a green card so he could reside in USA with his wife. Since there was no record of him having been in the USA before, the U.S. authorities would have no way of knowing that he had been there illegally.”, And also… as someone else stated… Mexico is NOT Siberia. If they’re such close family, THEY could’ve gone to Mexico for 1 year and done the process or – if it was legally necessary for the wife to stay to demonstrate hardship – he could´ve gone for 1 year. But no… they didn’t do what needed to be done and now the tears. Now, I think this issue is ON HIM and HIS WIFE. When she married a person without a legal status she knew perfectly well what she got into. They should’ve planned for this so that when/if this day came, they could all do something to face the future AS A FAMILY. Now, he’s been deported, but particularly if she’s retired (someone tell me please how do you “retire” before 40) they could all go to live in Mexico. It’s NOT the end of the world. So, if that family is separated, it’s their own choice. After all, if the wife and children are US citizens, they could ALL go to Mexico, do the 10-year penalty and re-enter legally. More so, if the kids wanted to return to the US upon being of legal age, they could well do so. So… no tears shed on this end. Don’t want to do the time, then don’t do the crime. She’s disabled due to a medical problem and their kids have medical issues. All the doctors that know their medical issues are in Detroit. But hey, let’s just up and move to Mexico with no income, a disable wife and sick kids. MFE – He had been here illegally since he was a child so one can assume he went through public school here—meaning there would be many, many records of him being in the U.S. As stated, lying to USCIS about this would only bar him permanently. Again, he had no options as he was brought here illegally through no fault of his own. The 2011 drug case people keep citing is not the same guy. The person in that case is a lawful permanent resident. who have suddenly been deported. Almost no one wants these visitors deported. living quite freely and openly in the same cities? No explanations have been offered by ICE. These officials are just doing their jobs. when they achieve many deportations. they are nevertheless deportable under current law. while living in the USA. These people are already known by the criminal-justice systems. anywhere in America remains completely unknown. Why were they not deported immediately? when they were in jails or prisons. when they were released after serving their time? who have been convicted of the most serious crimes. what our immigration officials are doing. we should deport murderers, rapists, and other violent felons. It is amusing to see all the negativity in some of the comments after all the in detailed explanation by the emigration attorney,if only people bother to read the article all their answers are explained in it. It’s interesting how you said that immigration petitions are waived when you can prove that your family would face serious hardship because of a deportation. Having a good lawyer who could help you compile and present that information would be a good idea. That way you could be sure to have everything that you need to be able to stay with your family where you are. He can be back after ten years ban and his kids can apply his dad when they turn 21.